Del-Tron's DL series linear lead screw actuators and ball screw actuators offer the benefits of a space-saving design, fast and simple assembly, long life, and a competitive price. The rigid enclosed aluminum box structure provides a compact envelope that incorporates the linear bearing and drive mechanism. Integrating all components into a single unit that includes the motor adaptor saves assembly time and eliminates the need to source additional parts. DL series linear actuators are offered in travel lengths up to 410 millimeters. These ball screw actuators and lead screw actuators utilize recirculating guide technology to provide a low profile and compact design solution. Our DW series linear actuators (double wide) is engineered to create a wider mounting platform while still maintaining the same low profile height as our standard width DL linear actuators. This double wide design is ideal for applications that need a greater carriage mounting area or where axial play must be minimized. The anti-backlash lead screw nut is spring-loaded to ensure positive movement when changing direction. The DL series lead screw actuators and ball screw actuators offer a straight-line accuracy of less than 2 microns and repeatability of less than 1 micron. A standard stepper or servo motor adaptor and coupling are provided at no additional charge. Other motor adaptors and motor couplings can be provided at your request. Photoelectric or proximity position sensors are also available. An anti-dust containment cover protects moving components while also preventing particulate emissions. Load capacities for our DL series linear actuators range from 150 newtons to 900 newtons. Del-Tron can provide special leads, diameters, couplings, motor mounts, and vary the size, type and travel of slides on request. 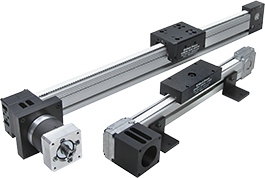 Other industry terms include linear actuators, ball screw actuators, ball screw driven stages, and more generally as linear bearings, linear motion slides, or simply motion slides.